For the established guys out there, how long before you were able to kick back and get a routine going? I've noticed my fitness going to sh!t and I need to sort it but don't have time right now. Is it an option to take on less work or even hire some help? About 5 years. When it's your company, you know what needs to be done. BUT I have found that taking more time off is more productive. Have you read Dave Allens "Geting Things Done" ? I got enough value from it though to call it a wise investment. Stop working 20 hour days???? Seriously!!! Can't wait for that day! I'm in a routine of working roughly 9 to 5, actually it's more like 10 to 4 but anyway Unless there is something very important that can't wait until the next day I tend to stick to my routine. My wife gives out to me if she catches me near anything work related in the evenings so that's probably a good thing. It's not good for the eyes to be stuck in front of the screen for too long anyway. Although I do like to try and take a sneak peek at the forums and read/research in my spare time if I get a chance. God I hope I'm not at this routine for 5 years. I've just let myself get severly run-down from too much work over the last 5/6 weeks and I really can't see that continuing. My health is starting to suffer (not eating properly, can't sleep cos I've got square eyes from the screen etc...). I think this is the time for me to take on junior or someone on a college break who would be glad of the summer experience. Have you read Dave Allens "Geting Things Done" ? I've started reading it - makes a lot of sense, but his writing is very dull. I would much rather sit through a seminar of same info for half a day. Presumably it's worth reading on and finishing? For me, having a family and the associated responsibilities/commitments really forces me to limit my day. I know I have to be at montessori for the evening pick up at a certain time, so I try not to get lost browsing online or arsing around wasting time. I'm doing approx 8am - 4pm, then heading to the gym for an hour before heading for the montessori pickup. Energy is much higher now that I'm fitting in the gym or a swim. Trying to give up coffee now also - was relying too heavily on it. I hope you're all making serious money to justify those kind of hours. The biggest killer of me is time wasted arsing around on Google Reader, digg, wikipedia, youtube, this forum at 5 in the morning. I waste a lot of time. I start at 07:30 6 days a week (sometimes even Sunday but not through the entire day), and don't usually finish 'till late that day. It catches up with me, my health is a disaster, coffee for breakfast - lunch - 'till 18:00 (never drink coffee after 6pm) and my cups are huge (the size of the Eiffel Tower) + smoking (bad for me but can not seem to be able to cut them down). Sometimes join the day, I need to get out to clear my head so I go on a drive for an hour or two. After 6pm if I don't work, I grab a book and flick through it (of course programming related) in front of the television or I help my kids with the xBox games. That's the down side of running your own business - long hours and the risk of killing yourself slowly and surely. Last week my family went to Wexford - Courtown, and I have been working till late (11-12 pm), and indeed I got a lot done, but... not good for me (health wise). Now you do the maths and see how many hours is that per/week. 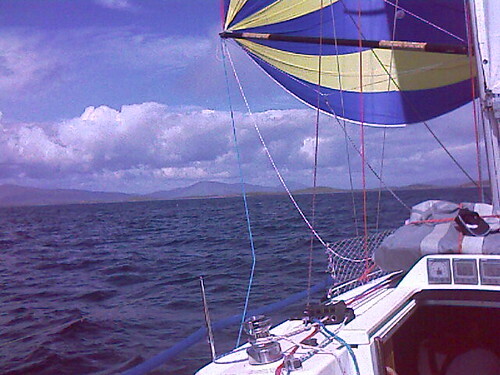 I took 3 days off last week and took a boat from Kilrush (Shannon Estuary) up to Westport. Did the world of good, I feel a lot better this week! i am going myself away next week for 7 days. Hope to feel as good as yourself. back home for a week. haven't seen my family for 2 years. Haven't posted here in a while, so as you can tell, I'm also working long crazy hours to the detriment of my health. However, I'm of to the sun in August for a week so hopefully that will bring me back to normal (or thereabouts ). where are you from Louie? been in ireland since '96 but i was born in romania.